‘…People might not always stay for a 30-minute sermon, but they will often stay for a three-minute song. Music has a beautiful way of disarming people and speaking to hearts. 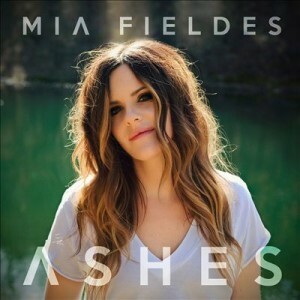 My highest goal is never ‘cool’ or ‘impressive.’ I always go for accessibility, especially when it comes to corporate worship, I’d rather have people singing the same line over and over and getting revelation from God, than being dazzled by rhymes and melodies…’ Mia Fieldes. Australian. Borne out of the same era as some of Australia’s most gifted CCM musicians, like Hillsong, Planetshakers and the like. Yet I’m sure that not many has heard of even Mia the songwriter, even though she has possibly penned a similar amoung of songs compared to other prominent American CCM writers like Jason Ingram and Seth Mosley. Now after years of being a songwriter, Mia has decided to release a 5 track EP of her own (while I do have on my iTunes playlist her 2009 indie album There’s A Reason, it cannot be found in cyberspace- maybe that album, because it was indie and released so long ago, isn’t necessarily considered a ‘proper’ signed release?). Nevertheless, Ashes EP, that released Tuesday, has by far some of my favourite worship songs I’ve heard since Bellarive’s Before There Was. From the Matt Maher co-written “Christ is Risen” to the Vertical Church Band fan favourite “If I Have You” and her single “Fearless”, we are called to be fearless in the face of failure, triumph and everything else in-between as we understand, believe and step into Christ and His power in and flowing through us. With virtually one of the only drawbacks being the shortness of the EP (it would’ve been better if there were more than 5 songs), Mia has crafted a set of songs certain to be thoroughly enjoyed by whomever listens, with each of them having the potential of being fan favourites by churches around the world. Releasing her first radio single on Provident Label Group earlier on during the year, “Fearless” is an encouragement to whomever hears it, as a strong piano presence starts a song that is by far one of the most engaging worship melodies I have heard all year. With Mia directing its theme towards us being fearless in spite and regardless of the roads we have travelled and will continue to throughout this life; we hear poignancy in the heartfelt lyrics that ‘…I am fearless, in Your presence, You’re all around me…in my weakness, You are strongest, You surround me…’ as Mia presents a song that can easily fit between Bethel, Chris Tomlin, Kari Jobe or Matt Redman in a Sunday worship service. While relatively new to being a singer/songwriter, Mia’s captivating vocals a la Kari Jobe or Nichole Nordeman, and a heart to worship that reminds me of artists like Christy Nockels or Meredith Andrews, Mia, by this song alone, shows us what an artist she is, and will be one of my first picks, alongside I Am They and Lauren Daigle, as standout new artists of 2015 so far! Co-written with Matt Maher back in 2009, “Christ is Risen” is a melody full of rich truth and heartfelt praise. A song that describes the truth that “…Christ is risen from the dead, trampling over death by death…”, we are brought to the realisation of God’s risen power in our lives and those around us that we can live fully knowing that His saving grace has made us new- thus our lives ought to reflect the change inside of us. Because of Christ’s risen power, we are overcomers- and with a great rendition of the song from Mia, “Christ is Risen” continues to be thoroughly enjoyed by myself all the years later from when Matt recorded it and placed it on his 2009 album Alive Again. Throughout the rest of the EP, Mia brings together a theme of being fearless in any circumstances we find ourselves in, and while each song is musically different from the next, the central theme and essence is still present. “If I Have You”, originally recorded by Vertical Church Band; tells of our own admission- that ‘…if I have You and nothing else, I have everything…’ A bold statement to declare; this Mia Fieldes penned track can be confronting, powerful, poignant and enjoyable all at once, especially when we realise that anything else we place in God’s spot isn’t going to fill us up, even honourable things like health, family and friends. Again with a piano riff introduction, “Ashes” tells of someone bringing ashes to God and watching Him ‘…call my heart to life…’ as we believe that everything we experience will be shaped for His glory and our good, while “Live and Breathe”, the first track and the most radio friendly/pop melody on the album, tells us of how living and breathing the presence of God is the key for us to experience and express gratitude and thankfulness, from our Father as well as sharing it with those around us. ‘…your songs can have amazing production and the right parts, and all of that’s important in helping to make it beautiful. But ultimately, I want to write songs everyone can own. I want it to carry the same thing for a 16 year old playing it alone on guitar in their bedroom as it does for a stadium of 20,000…’ Song accessibility- that is what Ashes is- a 5 track EP that can be enjoyed by people of all ages, and of all denominations of Christian faith. With Mia delivering arguably one of 2015’s best vocal performances so far, we see 5 tracks that could easily be one of my favourite songs of the year so far, depending on the day and how my mood is. While the only downside is that the EP was over very quickly (hopefully a full length album in the future? ); it is songs like “Fearless”, “Live and Breathe” and “If I Have You” that make me continue to enjoy and love worship music. Well done Mia for such an inviting and enjoyable EP, can’t wait til a full length album releases sometime in the future!